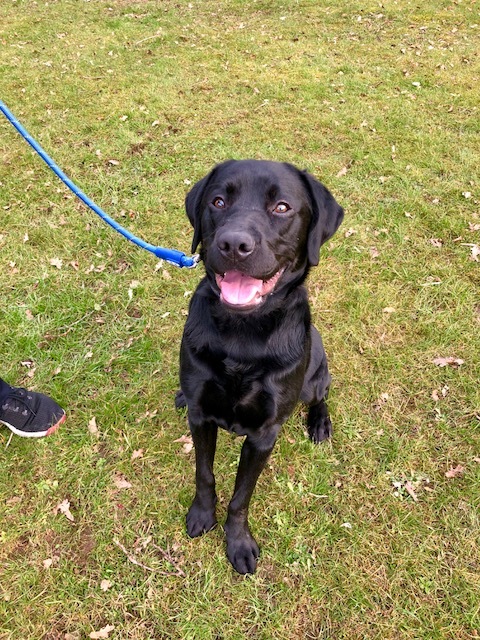 Dexter is a very handsome 21 month old Labrador. He is very reluctantly being rehomed due to a change in circumstances. He is still a big puppy at heart, and can be quite boisterous, but he does soon calm down. He is good with other dogs and children, although as he hasn’t lived with small children we are looking for a home with older children. Dexter suffers from mild IBD (irritable bowl disorder) he has had thorough investigations at Davies and it was suggested he was feed a particular diet, he is fed Purina HA, if he has this you wouldn’t know he had it! Whilst he was having investigations into his tummy issues it was discovered he only has one kidney! This doesn’t seem to bother him at all. Dexter will be a food thief if food is left out, after all he is a Labrador! this would probably upset his tummy if he was allowed to do so! We are looking for an experienced active home for this lovely boy, with someone around during the day, and someone committed to further training, he does know all the basics, apart from heel! He is currently left for long periods, but once he is receiving more exercise and stimulation he will come on leaps and bounds. Dexter is strong on the lead so definitely some training needed there. He is a kind lovely soul who thrives love and attention. If you are already registered with the Charity, and tick all the boxes please contact us. He is in the Herts, Beds, Bucks and Berks (North of M4) area. If you have any general questions about rescue please can you contact the Area Coordinator who covers your own area. Their details can be found on the contact tab of the website.